Industrial and strategic design as key of social innovation in humanitarian crises. Case: earthquake on 12th January 2010 in Haiti. | J. Ricardo Mejía S.
Industrial and strategic design as key of social innovation in humanitarian crises. Case: earthquake on 12th January 2010 in Haiti. Mejia Sarmiento, J. R., Ibarra, S., & Ortega Ospina, G.
This document is intended to explain one of the many ways in which industrial and strategic designers have the ability to formulate strategic plans when working with governments, NGO’s, and private corporations. These plans include the proposal of specific programs and the development of projects (designing products and services) thus giving innovative solutions for a humanitarian crisis. Given the situation in Haiti after January 12, 2010, the students of the course “Design and Organization” had mapped the context that makes possible the formulation of the plan “Haiti 2010.” It includes three programs (housing, education, and transport) and nine projects developed by three students working groups and that should be implemented or either in the short, medium or long-term. These programs and projects follow the United Nations Millennium Development Goals. The manuscript concludes with the presentations of the three projects as case studies. Scroll down to read the full paper (in Spanish). Cited (APA) as: Mejia Sarmiento, J. R., Ibarra, S., & Ortega Ospina, G. (Enero 2011). El diseño industrial y estratégico como clave de la innovación social en las crisis humanitarias, caso Haití. Diseño sin Fronteras, Departamento de Diseño, Universidad Iberoamericana Ciudad de México. 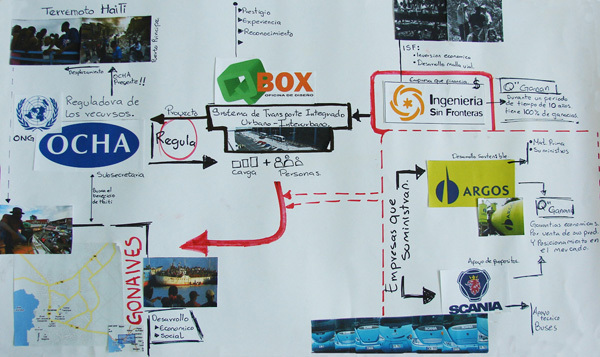 This text summarizes the academic experience of the subject “Design and Organization” during the first semester of the year 2010 carried out by a group of 27 students of the Program: Industrial Design  at the Universidad Nacional de Colombia, Palmira Campus. The exercise was developed during three weeks, and the proposal of a general strategy of intervention in Haiti and a set of specific solutions through systems of products was its final scope. Once a general panorama of work context had been determined, it was then possible to formulate the “Haiti 2010” Plan subdivided in three action programs leading to propose nine design projects, each of them being developed by an independent work team. The main objective sought by this exercise was to understand how industrial-strategic design and “design thinking” in general leads to propose innovative solutions in a concrete case of humanitarian crisis or in general to treat the so-called “bottom of the pyramid” . Industrial-strategic design understood as a designing activity helps to solve concrete problems in specific contexts. This profession has been redefining its professional work going from being a configuration job of products to become a work to identify opportunities in a particular context, formulation of strategies, definition of programs and projects and the determination of product-systems and its implementation. Theoretical views around the topic of “social innovation” leads to define it as the way how individuals or communities act to solve a problem or create new opportunities. These innovations are motivated toward producing durable social changes, rather than toward technological or market changes. Phills and others define social innovation as a novel solution to a social problem which is more effective, efficient and sustainable than others, thus accumulating value on the whole for society and not only for individuals. According to preliminary investigation, the economy of Haiti is the poorest in the entire American continent and one of the most disadvantaged of the world: 80% of its population lives under the threshold of poverty without stable employment neither access to education. In general terms he/she is a population of 2.5 trillion people who you/they live with less than $2.5 you dollars per day. Bearing in mind above issues, the work team proposed the vision, mission, objectives and scopes of “Haiti 2010” Plan that includes three programs (housing, education and transportation) solved to short (2010), mid (2012) and long-term (2015). It is desirable in each of the terms the development of projects following several business models, reactivating this way the economy and making it to evolve progressively while being executed; making solutions sustainable (economic, social y environmentally) as long as they gradually involve several actors of the project (private companies, governments and NGO’s). It is hoped in the short term to have players contributing resources for the production and implementation of projects, while it is sought in the mid term to involve companies sponsoring works propitiating then any type of long term entity investment. Housing, education and transportation programs were chosen in this humanitarian crisis answering the Millennium Development Objectives proposed by the United Nations Organization (UNO), especially the first two, that is to say “eradication of extreme poverty and hunger” and “achieving universal primary education” understanding that this is the aim for any country – whether developed or not – to be followed in order to improve their human development indexes (long and healthy life, education and decent level of life)  The solution proposed in each of the projects answers two clearly established logics; the first is the temporal, that is to say that it can be implemented in one of the terms defined by the plan (short, mid and long-term) and to housing, education and transportation common interests programs. These solutions are proposed within a series of strategy steps guaranteeing the integration of projects throughout the time, strengthening solutions and sustainably integrating them. In Economic Sciences, the bottom of the pyramid is the poorest and largest socio-economic group. It is generally a 2.5 billion people who live with under $2.5 US Dollars a day. Prahalad, C.K. Fortune at the Bottom of the Pyramid, the: eradicating poverty through profits, Editorial Wharton School Publishing, 2004. Juárez Vanessa. Innovación Social + Diseño Estratégico. Editorial Universidad Iberoamericana. Ciudad de México, 2009. Phills James, Kriss Deiglmeier & Dale T. Miller (2008), Rediscovering Social Innovation Review, Otoño, Estados Unidos. Este texto resume la experiencia académica de la asignatura “Diseño y Organización” durante el primer semestre del año 2010 realizada por un grupo de 27 estudiantes de la carrera de Diseño Industrial de la Universidad Nacional de Colombia sede Palmira. El ejercicio fue desarrollado durante tres semanas y tuvo como alcance final el planteamiento de una estrategia general de intervención en Haití y un conjunto de soluciones específicas mediante sistemas de productos (productos-servicios). El ejercicio fue planteado de manera ambigua, brindando información confusa y desestructurada, logrando así que el grupo de estudiantes se viera en la necesidad de trabajar conjuntamente en una investigación preliminar y un ejercicio de análisis y síntesis. Gracias a este levantamiento de información se elaboraron “mapas mentales” y diagramas de análisis de las condiciones previas y posteriores al terremoto del 12 de Enero del 2010 en Haití. Una vez establecido un panorama general del contexto de trabajo fue posible formular el Plan “Haití 2010” subdividido en tres programas de acción que permitieron el planteamiento de nueve proyectos de diseño, cada uno de ellos fue desarrollado por un equipo de trabajo independiente. El objetivo primordial que perseguía este ejercicio era el de entender como el diseño industrial-estratégico y en general el “design thinking” permite la formulación de soluciones innovadoras (innovación social) en un caso concreto de crisis humanitaria o en general para atender a la llamada “Base de la Pirámide”. El diseño industrial-estratégico entendido como una actividad proyectual propicia la solución de problemas concretos en contextos específicos. Esta profesión ha venido redefiniendo su labor profesional pasando de ser una labor de configuración de productos convirtiéndose en un trabajo de identificación de oportunidades en un contexto específico, la formulación de estrategias, definición de programas y proyectos y la determinación de productos-sistemas y su implementación. Las aproximaciones teóricas alrededor del tema de la “innovación social” apuntan a definirla como la forma en que los individuos o las comunidades actúan para resolver un problema o para generar nuevas oportunidades. Estas innovaciones son motivadas hacia producir cambios sociales duraderos, más que hacia cambios tecnológicos o de mercado. Según la investigación preliminar la economía de Haití es la más pobre de todo el continente americano y una de las más desfavorecidas del mundo, el 80% de su población vive bajo el umbral de pobreza sin un empleo estable ni acceso a la educación. Teniendo en cuenta estos aspectos el equipo de trabajo planteó la visión, misión, objetivos y alcances del Plan “Haití 2010” que incluye tres programas (vivienda, educación y transporte) solucionados en el corto (2010), mediano (2012) y largo plazo (2015). En cada uno de los plazos es deseable el desarrollo de proyectos siguiendo diferentes modelos de negocio, reactivando así la economía y haciendo que esta evolucione progresivamente en los tiempos de ejecución; logrando que las soluciones sean sostenibles (económica, social y ambientalmente) en la medida en la que involucran gradualmente a los diversos actores del proyecto (empresas privadas, gobiernos y ONG´s). Figura 3. Formulación del Plan, sus programas y proyectos. En el corto plazo se espera contar con actores que donen recursos para la producción e implementación de los proyectos, mientras que en el mediano plazo se pretende involucrar compañías que patrocinen obras que luego propicien la inversión de cualquier tipo de entidad en el largo plazo. La solución planteada en cada uno de los proyectos responde a dos lógicas claramente establecidas; la primera es a la temporal, es decir que pueden ser implementadas en uno de los plazos definidos por el plan (corto, mediano y largo plazo) y a los intereses comunes de los programas de vivienda, educación y transporte. Estas soluciones se plantean dentro de una estrategia escalonada que garantiza la integración de los proyectos con el paso del tiempo, robusteciendo las soluciones e integrándolas sosteniblemente. – El proyecto “Sistema modular para vivienda de emergencia” en el corto plazo dentro del programa de vivienda. – El proyecto “Muebles con corazón” en el mediano plazo dentro del programa de educación. – El proyecto “Sistema de transporte integrado” en el largo plazo dentro del programa de transporte. El programa de vivienda responde a tres plazos y modelos de negocios complementarios. El corto plazo cubrirá las necesidades inminentes de cobijo mediante un “elemento de refugio temporal para damnificados en zonas de desastre”, coordinado y desarrollado por ONG’s con las donaciones de diversas empresas privadas; luego de esta solución inmediata en el mediano plazo es posible la estructuración de pequeños barrios que se apoyan en patrocinios específicos de ONG’s y empresas. Finalmente el largo plazo está resuelto mediante la consolidación de los barrios ya construidos y el desarrollo de proyectos emprendedores (mini-empresas) para apoyar la economía local en las ciudades y villas haitianas. Figura 4. 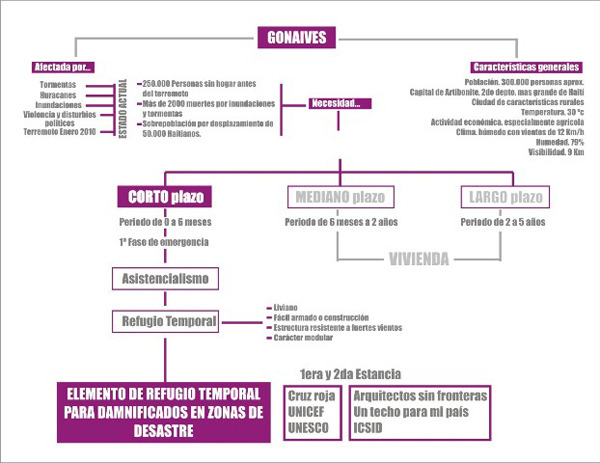 Estrategia del Programa de Vivienda. El “Sistema modular para viviendas de emergencia” en el corto plazo plantea un elemento de refugio temporal para damnificados, que buscaba obtener un producto liviano, modular, de fácil armado y construcción con una estructura resistente a los fuertes vientos. En la dinámica conjunta entre las organizaciones se destaca la planificación y gestión de UNESCO y el apoyo de otras ONG’s como “Un techo para mi país” en la estructuración y desarrollo de las viviendas emergentes. El diseño final está compuesto por piezas modulares tipo auto-ensamble que reducen costos y procesos de fabricación, no es necesario contar con una habilidad especial para el armado de los módulos debido a que son monobloques que permiten una rápida variedad de configuraciones. Figura 5. Producto final: Sistema modular para viviendas de emergencia. La inversión en educación garantiza que las comunidades tengan mejores oportunidades y una visión más clara en la toma de decisiones para su desarrollo. El programa de educación esta formulado en tres plazos para el apoyo en la reactivación de las actividades escolares en Haití. 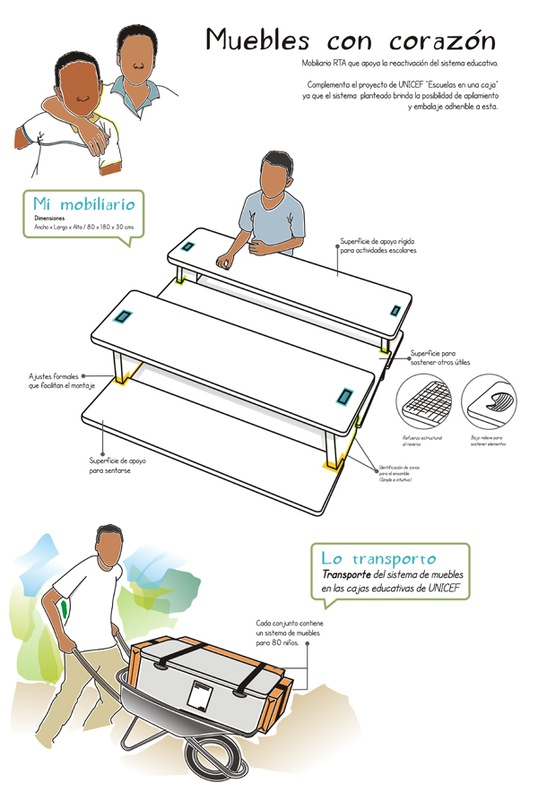 En un corto plazo se generan espacios temporales de trabajo académico en las zonas urbanas llamados “carpas escolares móviles”; en el mediano plazo serán complementados con un sistema de mobiliario listo para armar (Ready-to-assemble (RTA)) que al iniciarse la reconstrucción de los centros educativos se trasladan a villas cercanas. Finalmente en el largo plazo se ejecutan las estrategias de infraestructura y capacitación docente en la ciudad, reforzado con el mejoramiento de las instalaciones de educación básica en las villas y movimiento de las “carpas escolares” al campo. Figura 6. Proyectos al interior del programa educación. El proyecto “Muebles con corazón” se propone como un apoyo a la reactivación del sistema educativo en Haití entiendo que la educación es fundamental para el progreso de una comunidad. Se diseñó un sistema de mobiliario listo para armar que se integra al programa de las Naciones Unidas “escuelas en una caja” como complemento a las escuelas temporales que UNICEF tiene en el país con el objetivo de proteger y brindar un ambiente estable a los niños y niñas de la región. El grupo de trabajo generó una estrategia a mediano plazo en donde a través de patrocinios de empresas privadas y organizaciones no gubernamentales (ONG’s) se lograra la ejecución del proyecto. Los diseñadores plantean las propuestas y estrategias de diseño, las empresas privadas de manufactura de plásticos y transporte de mercancía serían las patrocinadoras en la consecución del mobiliario y el transporte del mismo, las ONG’s en conjunto con UNICEF serán las coordinadoras de las entregas, distribución y ensamblaje del mobiliario. Bajo esta sinergia entre instituciones, las empresas privadas obtendrían un reconocimiento a su compromiso social e incentivos tributarios, mientras que las ONG’s además de lo anterior adquieren beneficios que las ayudarían a fortalecer sus programas educativos en Haití. Figura 7.Estrategia del proyecto de educación. En complemento, el objeto fue desarrollado teniendo en cuenta las características del contexto de uso que ayudaron a determinar su tipología para facilitar los procesos de transporte y ensamblaje. En términos generales, el sistema propuesto es un conjunto de superficies para sentarse a nivel del suelo y una de apoyo principal para escribir. Cada conjunto está pensado para que cuatro niños realicen sus tareas académicas en el. Los sistemas de ensamble están diferenciados por zonas de color y es apilable y ajustable a los contenedores “escuelas en una caja”. Figura 8.Producto Final Mobiliario listo para armar. El transporte responde a las necesidades básicas de la movilidad de los ciudadanos, quienes podrán desplazarse a sus trabajos, escuelas y hospitales, garantizando su desarrollo laboral, social y humano y permitiendo el establecimiento de un sistema económico estable gracias al intercambio de bienes de consumo. El programa de transporte da respuesta a los tres plazos establecidos por el plan general y permite el desarrollo de diversos modelos de negocio. Para el corto plazo se atenderá la necesidad inminente de “restaurar la movilidad, entendida como el transporte de carga y personas” gracias a un sistema de limpieza que permitirá recoger los escombros en las zonas urbanas más afectadas, recuperando así la malla vial, empleando personal local luego de procesos de capacitación implementados por OCHA y el Ministerio de Transporte. Figura 9. Proyectos al interior del Programa Transporte. Consecuentemente, en el mediano plazo, se implementará un sistema de vehículos de carga para estimular las economías locales y movilizar los productos de consumo a lo largo y ancho del país, activando terminales ocasionales en distintas poblaciones del país vinculadas con la agroindustria y creando redes completas en un sistema de rutas entre ciudades y poblaciones de menor tamaño. Los conductores de estos vehículos serán parte de la población local luego de capacitaciones en materia de conducción y normas de tránsito. Finalmente en el largo plazo se pretende consolidar una infraestructura estable y permanente de terminales de transporte, para atender el transporte de personas, y lugares de distribución de bienes, para el transporte de productos, mediante el desarrollo de un “Sistema de transporte -urbano e interurbano- integrado”. Dicho sistema de transporte permitirá la conexión de distintas ciudades del país mediante un parque automotor desarrollado específicamente para este contexto -para el diseño de los vehículos trabajaran simultáneamente oficinas de diseño e ingeniería garantizando una respuesta a la medida de las necesidades de la población haitiana- y gracias a una infraestructura construida respetando las condiciones económicas, sociales y ambientales del país. Figura 10.Estrategia del Proyecto Transporte. Mediante la administración de recursos por parte de OCHA y el trabajo mancomunado de varias ONG’s y organizaciones privadas -que invertirán en estos proyectos- será posible restaurar la movilidad en el país haciendo especial énfasis en su impacto en la economía local y su positiva influencia en el desarrollo social de estas comunidades. Figura 11. Producto Final Sistema de transporte -urbano e interurbano- integrado. Mediante el desarrollo del proyecto fue posible entender el re-direccionamiento que ha tenido la labor del diseñador industrial-estratégico en los mercados de la base de la pirámide y como el “design thinking” contribuye satisfactoriamente a la resolución de problemas de alta complejidad dentro de procesos de innovación social. Otro aspecto interesante dentro del desarrollo del proyecto fue el descubrimiento de los diversos niveles en los que el ejercicio del diseño puede aportar; iniciando con un pensamiento holístico y general, determinando estrategias, planes y programas; hasta una resolución táctica-operativa y particular gracias al desarrollo de productos-servicios, que en conjunto colaboran con la resolución de un problema de gran magnitud. Se propone la continuación de este tipo de proyectos con miras a determinar metodologías y estrategias de abordaje particulares para este tipo de proyectos. Juárez Vanessa. Innovación Social + Diseño Estratégico. Editorial Universidad Iberoamericana Ciudad de México, 2009. Phills James, Kriss Deiglmeier, & Dale T. Miller (2008), Rediscovering Social Innovation, Stanford Social Innovation Review, Otoño, Estados Unidos. Prahalad, C.K. Fortune at the Bottom of the Pyramid, the: eradicating poverty through profits, Editorial Wharton School Publishing, 2004. 0. Cabezote 1.Mapeo del contexto – Haití 2010, 2. Estructura general del Plan Haití 2010, 3. Formulación del Plan, sus programas y proyectos, 4. Estrategia del proyecto de vivienda, 5. 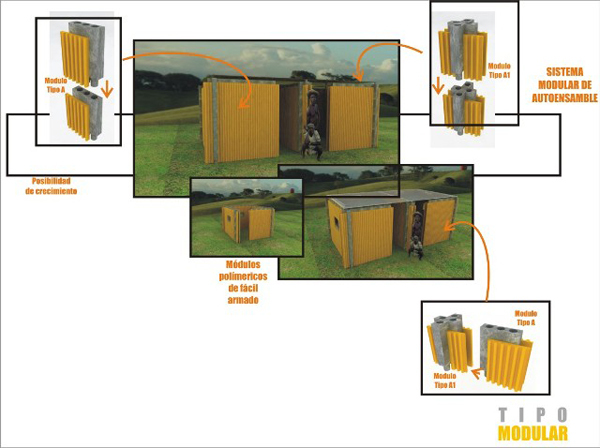 Producto final: Sistema modular para viviendas de emergencia, 6. Proyectos al interior del Programa Educación, 7. 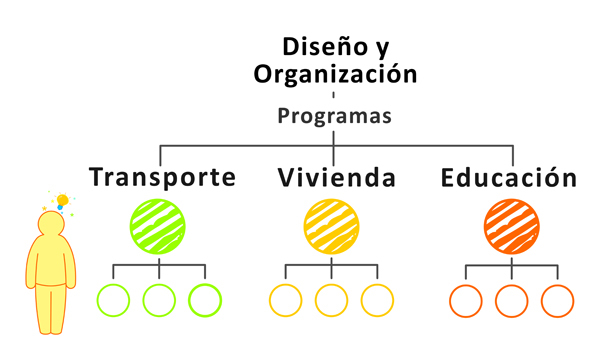 Estrategia del proyecto de educación, 8. Producto final: Mobiliario listo para armar, 9 Proyectos al interior del Programa de Transporte, 10. 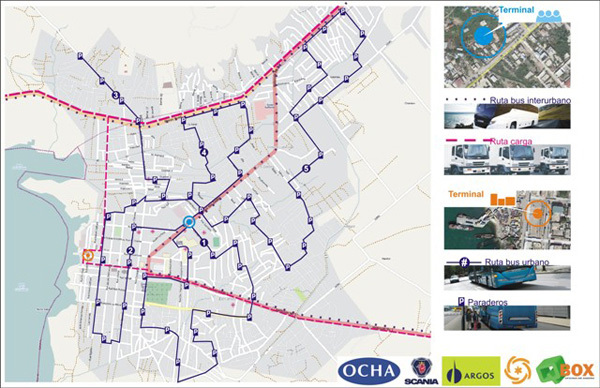 Estrategia del proyecto de Transporte, 11. Producto final: Sistema de transporte -urbano e interurbano- integrado. En las ciencias económicas la Base de la Pirámide (the bottom of the pyramid) es el grupo socioeconómico mas pobre y grande. En términos generales es una población de 2.5 billones de personas quienes viven con menos de $2.5 UD dólares por día. Prahalad, C.K. Fortune at the Bottom of the Pyramid, the: eradicating poverty through profits, Editorial Wharton School Publishing, 2004.
jrms.pktweb.com’s done it once again. Great read! Con el debido respeto, Sería bueno resaltar todos los integrantes de trabajo realizado en la asignatura diseño y organización ya que fue un trabajo realizado en grupo por todos los integrantes de dicha asignatura, es ética profesional y respeto por los demás integrantes que realizaron el trabajo. reitero el asunto con cordialidad, seria de caracter etico y profesional, resaltar que fue un trabajo desarollado en grupo ya que veo trabajos en los cuales son de otras personas que vieron la asignatura, por el respeto al trabajo desarrollado por ellos, es conveniente respetar el derecho de autor, reitero por el caracter etico profesional. En principio, mil gracias por su mensaje. Quiero hacer varias anotaciones, la primera y mas importante es que a todos y cada uno de los integrantes del grupo de “Diseño y Organización” se les invitó a participar de la construcción de este documento y solamente los dos coautores respondieron a dicho llamado así que ellos y solamente ellos pueden y deben tener el crédito de lo que acá esta escrito. Por ultimo, las ilustraciones del planteamiento general del plan y programas son de autoría de Sara Ibarra una de las coautoras del documento y las demás imágenes son de los estudiantes de tres grupos de trabajo a quienes se les solicitó dicha información explícitamente. Nos daremos a la tarea de indicar los autores de las imágenes con sus respectivos créditos prontamente. Su mensaje anterior no fue borrado, lo que sucede es que, cualquier blog previo a la publicación de los comentarios, los envía para la revisión del autor o moderador del blog. Creo que su inquietud ya fue resuelta. específicamente es el punto que me refería (Nos daremos a la tarea de indicar los autores de las imágenes con sus respectivos créditos prontamente.) estaré pendiente de la información que falta. or go for a paid option? There are so many options out there that I’m totally confused .. Any suggestions? Kudos!